Minnesota springs and summers mean it’s time for outdoor entertaining. If you’re debating whether to install a patio or a deck for your outdoor get-togethers, these pros and cons will help with the final decision. Decks are essentially outdoor floor space that’s directly attached to your home. Usually, they’re made out of wood, often cedar or redwood, both of which have oils that discourage insect infestation. Sometimes, they’re made out of composite wood, which is made out of recycled wood which won’t crack or warp. Pros – Decks are ideal for areas that need a platform instead of a structure that takes up a lot of ground space. This is because decks are usually elevated to some degree. They’re also a smart choice if you have large trees that you don’t want to risk harming. They can be built around these plants without touching the root system. 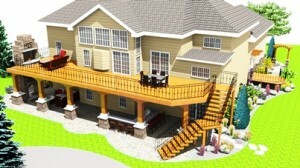 Cons – Since they need support structures for the floors, decks are better left to a professional to design and build. This tends to make them more expensive than patios. They also require more maintenance, since they need to be sealed at least once a year to protect against insect or water damage. Originating from the Spanish word that means “courtyard”, patios are a part of your home’s hardscape. It’s basically a paved area alongside your home, often with sliding glass or French doors. Pros – Since there’s less grading involved, and most materials are easy to manipulate, it’s a good candidate for do it yourselfers. You can also make them out of anything from recycled concrete slabs to gravel, and they’re generally less expensive than decks. They also take less maintenance. Cons – If you have large trees, they’re not a good fit. They can’t be built without risking damage to your plants. Regardless of which choice you make, both decks and patios add beauty and functionality to any home. Undecided on which outdoor gathering area would work best for your home and your overall landscape plan? ALD designs and installs decks and patios – give us a call and we’ll work with you to produce just the right space.